Lavender and vines along the entranceway to the hilltop facility. My dragon spawn turned 21 recently. It’s so hard to wrap my head around the concept of this full-fledged adult being the same teeny wrinkly purple thing I brought home 21 years ago. I have realized that 21 years is not that many years. It’s nearly half my life, but dang, it went like a blink! 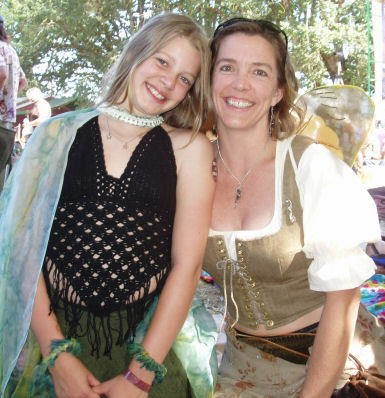 Tara and me at one of our first Faerieworlds festivals. 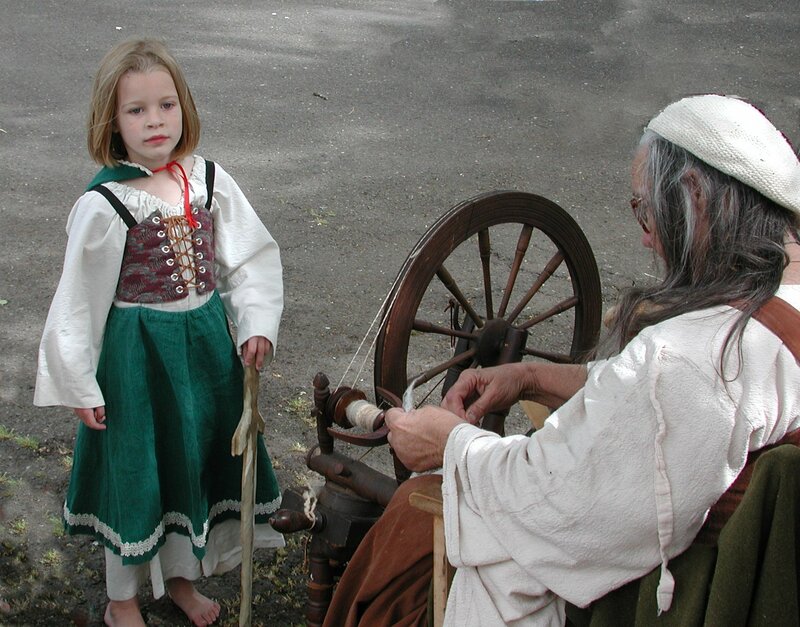 Our tradition, you may recall, is to go to The Enchanted Forest in Salem. I’ve had loads of fun with Tara and their awesome friends, visiting the theme park year after year and living out our childhoods with abandon on one brilliant July day. Right next door to Enchanted Forest is a winery that we had only spotted from the Interstate. 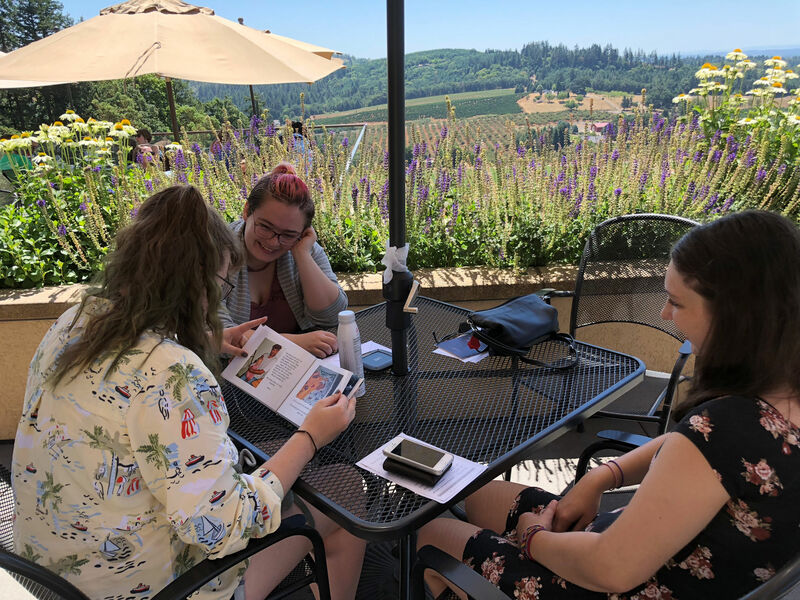 This year, since Tara is of legal drinking age, their birthday idea was to visit the winery. 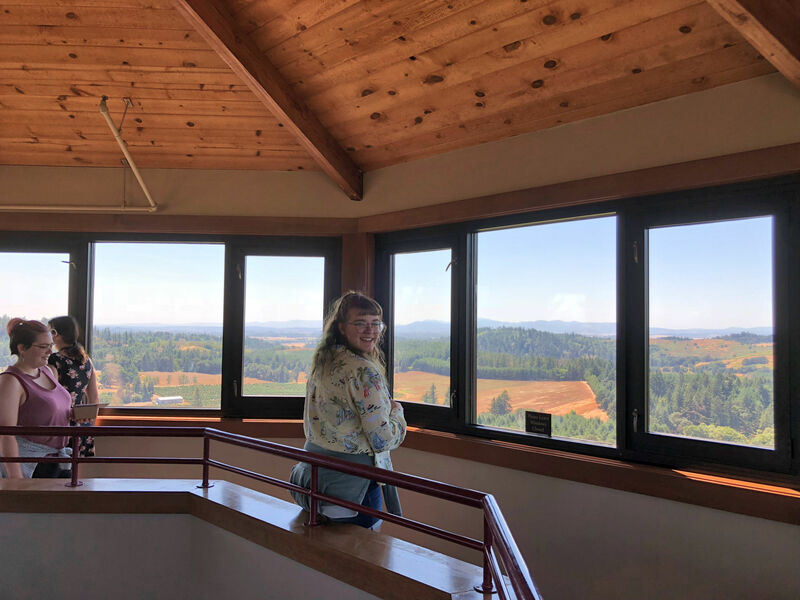 I called Willamette Valley Vineyards and explained it was a birthday visit and asked what a person might do there for fun, other than tasting wines. They suggested a tour, and I made a reservation. 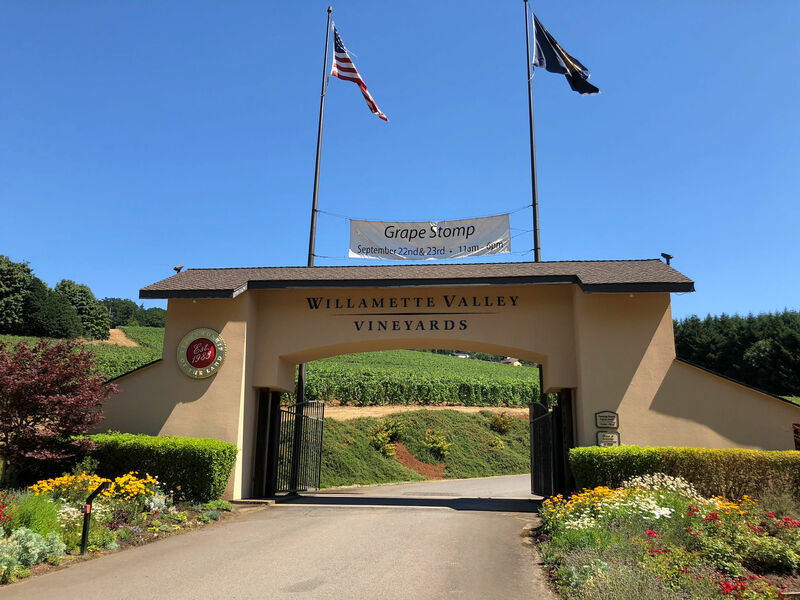 Willamette Valley Vineyards is a first-class destination, which made this a serendipitous choice. Until we arrived, we had no idea what an enormous, visitor-centric place it is. Sadly, I neglected to get some photos of the main tasting room, but it’s huge and oh so beautiful. There are three bars with about 8 people tending, who can all help you with tasting a flight of wines, or purchasing, or eating lunch, or touring, or even booking a night’s stay because yes, this place also has guest lodging. I imagine it would be a wonderful stay. The main buildings are at the top of a hill, and thus visitors are afforded incredible views in every direction. Just in case you want something even better than the view available in the dining and tasting rooms, there is a tower one can climb, which puts you another 50 feet up. Tara celebrating their birthday in the tower. Molly and me, at our main gathering place during the tour. The tour is also a tasting. We tasted 5 different wines, some award-winning, during the tour. Our guide, Suzanne Zupancic, put us at ease and made us feel like she was our friend right away. 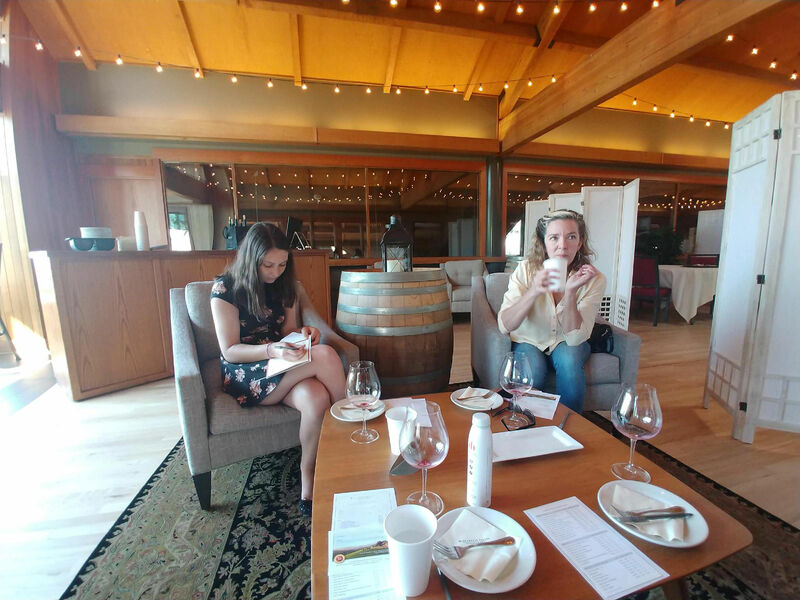 Suzanne led us through the different stages of wine production at Willamette Valley, to include the history of the vineyard’s existence, and the bottling station and of course the barrel storage. 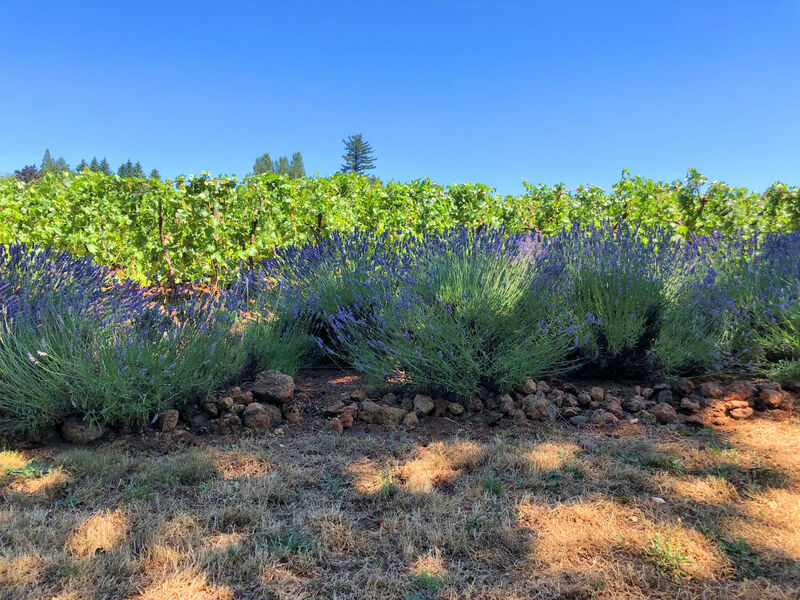 She told the story of the founder, Jim Bernau, who grew up knowing wines because his father was an attorney for the first vineyard in Oregon after prohibition. She explained how the winery is solar powered, doesn’t irrigate, and instead of typical pest control, partners with a raptor rescue organization to use owls to control the rodent population! She explained some general concepts to help us in choosing a wine, such as when a wine is sweeter, there is generally less alcohol. Knowing this, a quick glance at the label can help you choose what you’ll like. She talked about Oregon’s famous pinot noirs, a thin-skinned grape that has caught the wine world’s attention. 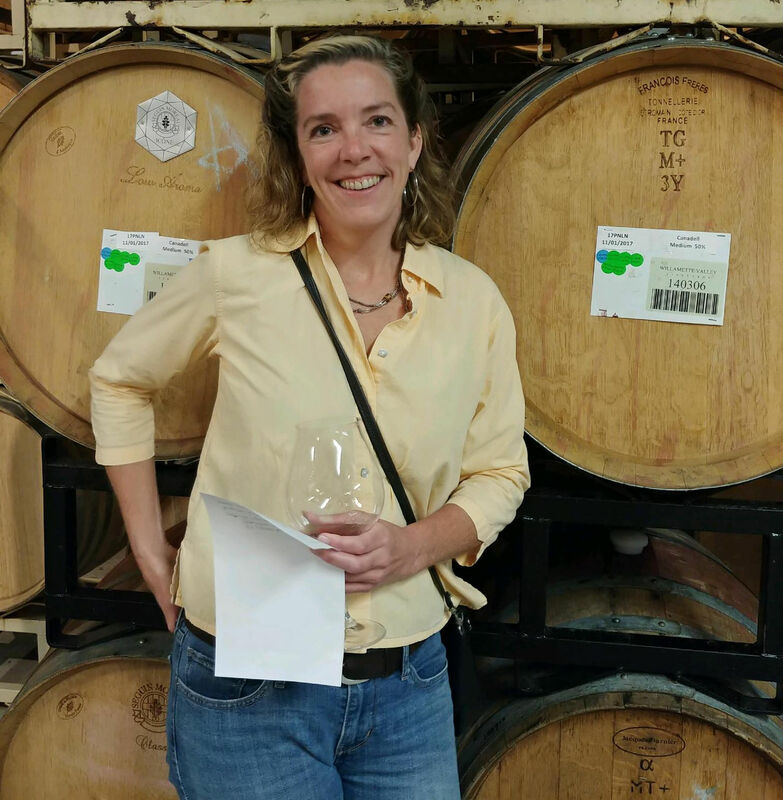 She taught us about cooperage, the craft of building wine barrels, and how to understand the labels on the outside of the barrels. She also explained why so many barrels are stained red. 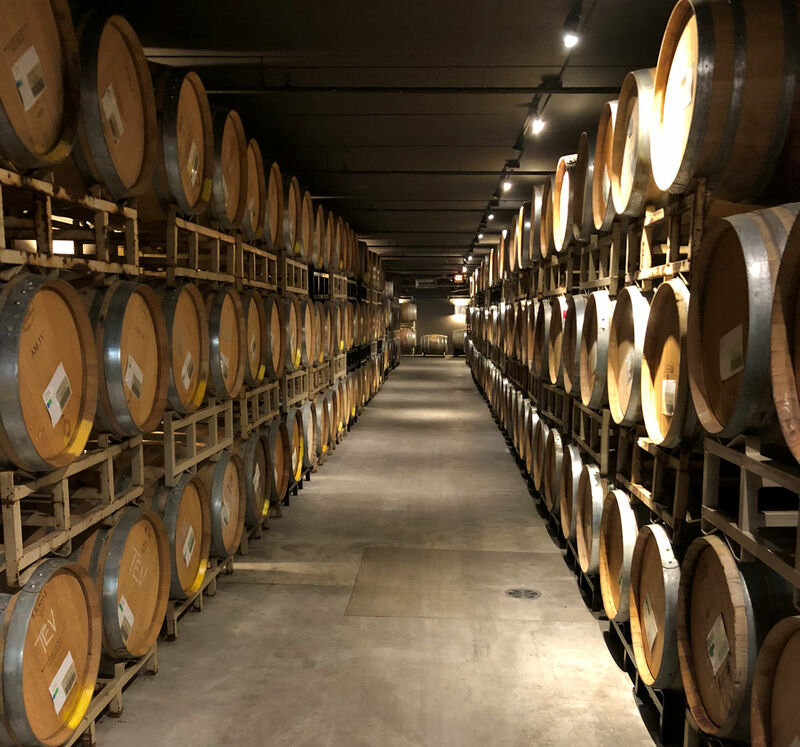 It’s because the wine slowly evaporates and the only way to maintain its integrity is to top off the wine frequently, and not allow any oxygen inside the barrels. Topping off tends to end up with a little bit of wine spill, that drips down the side and stains the barrel. She explained that Cabernet sauvignon and Merlot benefit from aging, but others do not. A door leading from the red wine barrels section. Me with as much wine nearby as I could ever wish for. It’s not a flattering photo, because everyone is squinting in the bright sun. Suzanne also told us about Bill Fuller, a legendary winemaker in Oregon. He left California’s Napa valley in 1973 to take advantage of the ideal geography in Oregon’s Willamette Valley. 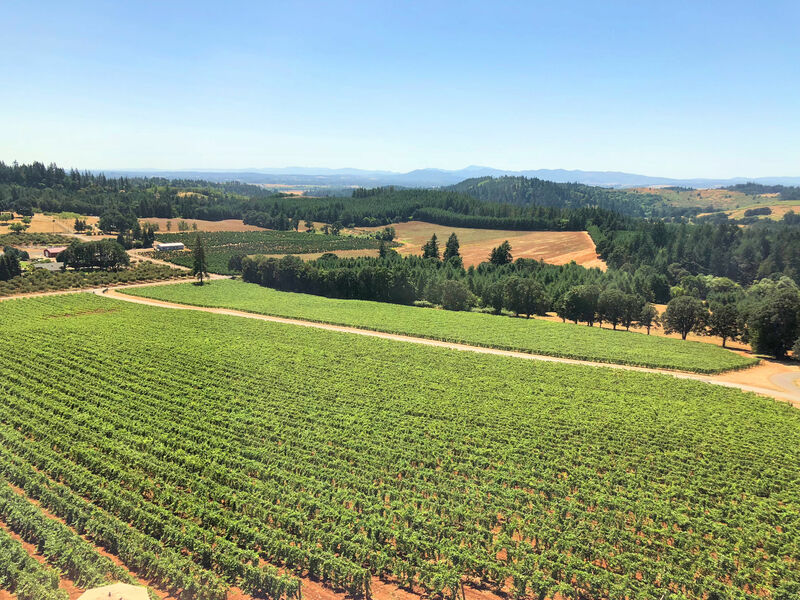 His Tualatin Vineyard 1980 Pinot Noir and 1981 Chardonnay took home “Best of Show” in both red and white categories at the 1984 London International Wine Fair, a feat unduplicated by any winemaker in the competition’s history. 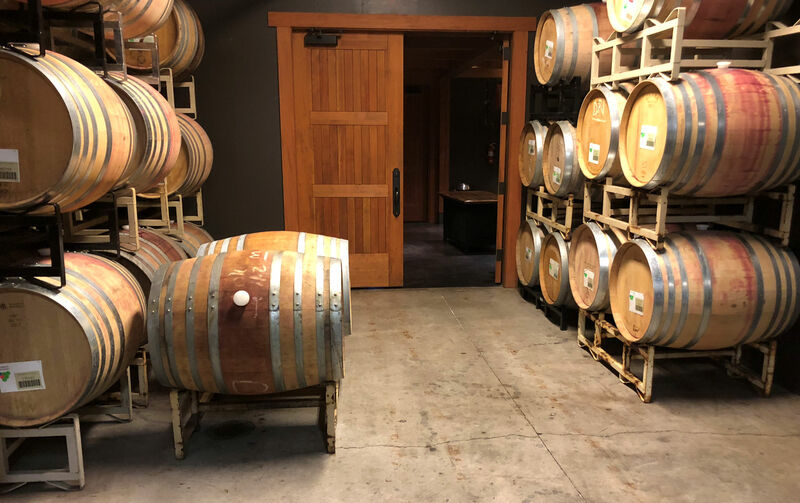 Bill Fuller’s winery merged with Willamette Valley Vineyards, and Mr. Fuller began working with Willamette Valley Vineyards in 2013. 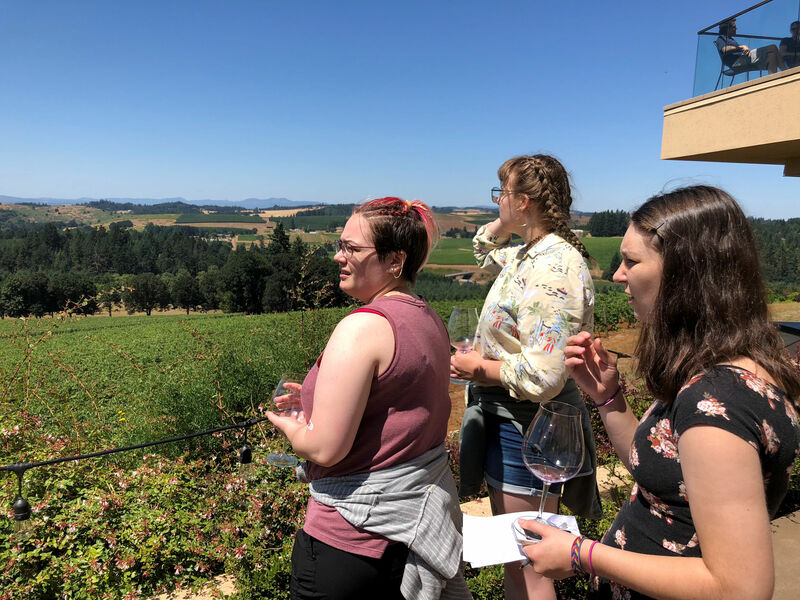 She also explained about the remarkable geologic processes that made the Willamette Valley so rich for agriculture and particularly for grapes. The history includes a historic sea, volcanic processes, and the Missoula Floods. Tara, a geology major at Oregon State University, was interested in this portion of the tour. After the hour and a half long tour, and five wines, we were all ready for some food! We ate from their gourmet menu and sat out on one of the many outdoor patios to eat it. We were joined by bees. Interestingly, the staff handed us fabric softener sheets to place on the table to keep the wasps away. It was a little effective. 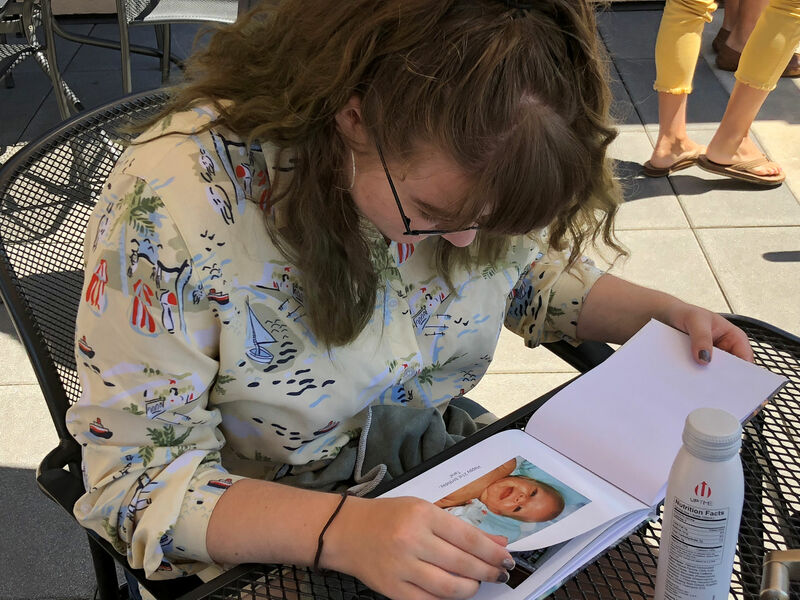 At lunch, I gave Tara a gift I had made of childhood photos through the years. Tara read the book outloud to all of us. Tara opens up the memory book I made as a birthday gift. Tara reading their birthday book to us. Finally, we were ready to go and purchased some of our favourite wines from the day. I said goodbye to the kids who were all headed back to Corvallis. You know, I should have taken photographs of the book before I gave it to Tara. Didn’t think of that. But yes, it was so fun to make it and give it. And yes. Derrick. My child is 21 years old. For heaven’s sake. I have had so much fun with photobooks the last couple of years. I try to do a book with my photos whenever I go on a trip, and they let you annotate, which for Crystal means totally writing a book if I don’t get control of myself. At least for Tara I managed to keep it totally cool and only wrote a little bit. It was so fun to have Tara’s friends there celebrating. They were all so awesome, asking intelligent questions and making astute comments on the wine we tasted. It was a wonderful time. I just can’t believe what an amazing relationship I have with my child. I get to participate in their life all the time, meet their friends, be present for big moments. It’s a gift and I never stop feeling grateful. Excellent birthday, congratulations to Tara! As for Ms. Zupancic, this is an extremely common Slovenian surname so I wonder if this is her heritage. There are plenty of great wines in Slovenia as well.